Aligarh: Much like the rest of India, the political mood in the lock-making hub of Aligarh in this election is swinging between two poles — joblessness and nationalism. But depending on who you ask, the hero or villain of the story differs. Both these issues are closely tied to perceptions about the city’s politically-polarising institution, the Aligarh Muslim University (AMU). Deepak Kumar and Manzoor Ahmad, both in their early 20s, have little hope of getting employment. Their politics today is shaped by the looming shadow of the 99-year-old AMU, but that’s where the similarity ends. Kumar argues that AMU doesn’t “give admission to Hindus”, which has led to their psychological alienation in the city. AMU records show that it has enrolled many Hindu students and faculty. But the perceptions that are gaining ground about the university has no room for facts. Ahmad praises the composite culture of AMU and points out that it opened up opportunities that his parents never had. Kumar claims he is pursuing an undergraduate science course through ‘distance learning from a private institute in Aligarh’, while Ahmad is studying linguistics and mass media at AMU. Kumar plans to join the armed forces. Ahmad is considering a career in journalism. “My primary concern after leaving the university will be to get a job and I want a government which ensures that there are enough job vacancies. AMU has helped us in acquiring skills for employment but if there are no job vacancies, what will we do with these skills?” the 21-year-old Ahmad asks. These views are not accidental. As recently as 11 April, AMU’s name found mention in the election speech of Uttar Pradesh Chief Minister Yogi Adityanath at Atrauli in Aligarh. During a public meeting in the constituency, Adityanath claimed that SC/ST and OBC reservation will be implemented in AMU while praising sitting BJP MP Satish Kumar Gautam for raising the issue of Muhammad Ali Jinnah’s image in the varsity. The CM, while referring to Jinnah, maintained that there was no respect for people who divided the nation. Last year, Gautam had written to AMU authorities and sought an explanation on Jinnah’s image being displayed the AMU Students’ Union office. The university administration explained that Jinnah was a founder member of the university court and also a donor. They added that he had been given life membership long before the demand for Pakistan had arisen. According to BJP sources in UP, it was the Jinnah portrait episode that made the party field Gautam again. “(Rajasthan Governor) Kalyan Singh belongs to Atrauli area of Aligarh, and his family holds sway over nearly two lakh voters of the Lodh community. There was talk of the Aligarh ticket being given to one of his family members, but that did not happen and the Hindutva image of the sitting BJP MP made the party field him again,” a senior BJP leader says. Gautam is taking on BSP-SP-RLD candidate Ajeet Balyan and Congress’ Brijendra Singh, a former MP and four-time MLA. The constituency goes votes on 18 April. More recently, in February, the AMU campus had witnessed a crackdown following a clash between student groups. Fourteen students were booked under sedition charges, but later, these charges were withdrawn by the police due to “lack of evidence”. The clash had erupted after protests and an alleged attack against a television crew which was visiting the AMU campus. In the weeks that followed this incident, two controversies had hit AMU — when a law student and kin of a local BJP leader had taken out a ‘Tiranga Yatra’ without permission, and demanded the construction of a temple inside campus to enforce AMU’s “secular character”. At Barauli village, Kumar and his friends Bipin Kumar (19) and Anurag Singh (18) gather near a kirana (grocery) store, listening intently to the shopkeeper stating that bad roads in the area are a major concern in this part of Aligarh Lok Sabha constituency. But no matter what the conversation is about, everything in Aligarh quickly devolves into what AMU has come to represent in the popular imagination. It’s not just the history and politics of AMU, but even its prospect as a job-generator is contested. “They have hijacked the university even though it is owned by the government. Their people get admission in the university and jobs,” adds Singh, who finished high school last year and also wants to join the armed forces like Deepak Kumar. 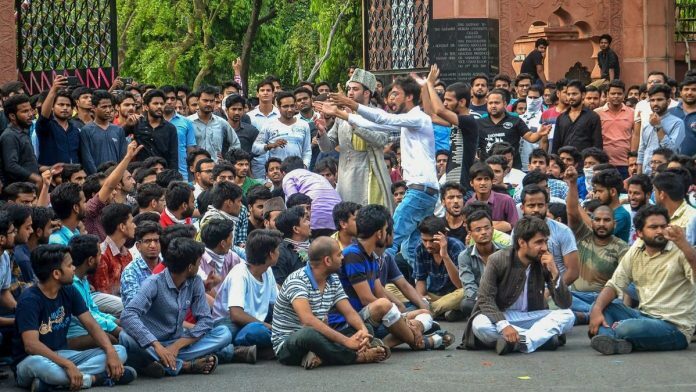 At AMU, both students and faculty are grappling with this very image of AMU. The two postgraduate students, however, maintain that there is one aspect which is peculiar to the being a student at AMU. “We are the discriminated lot. When the JNU episode happened, nobody was asked to go to Pakistan; they were not made to feel that they don’t belong to this country. Here, anything happens, you are sent a ticket to Pakistan. We are at a university which has a history of nationalism, we have made contributions to this country and so this hurts,” Shah adds. On what scale are you measuring that on? Is that something as “deft” like drawing a parallel with India’s demographics national in spite of the “exploding population of a particular community and declining population of other” since decades? For a minority-centric institution??? Okay, then. Have you got the numbers of the BHU and various Allahabad universitas ready yet?